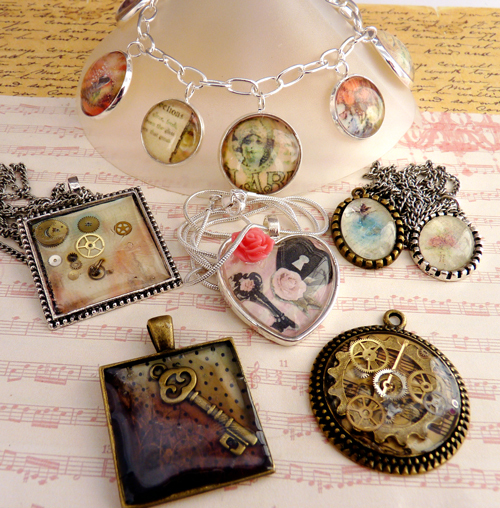 Use Altered Art techniques along with our Photo Pendants range to create a multitude of fabulous pendants and jewellery with a vintage look or even a fresh, modern feel. 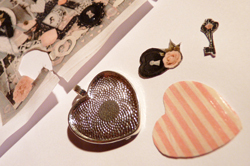 You can use scrapbook papers, copyright free images or even family photographs to decorate. 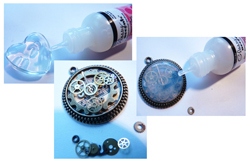 Finish off with charms or, for a steampunk style, add a scattering of tiny watch components which are also available on our website. You can use glass cabochons to complete the pendants or set charms inside using a super product called Glossy Accents, which sets clear and hard and holds the charms in place. Choose a photo, image or paper that you’d like to use as the background in your piece. 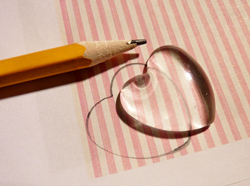 Place a Glass Cabochon onto the paper and move around until you’re happy with what you see through the glass then draw around the glass to create a template. Cut out your sealed paper templates. 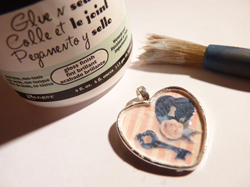 Take a small dab of the Glue ‘n’ Seal on a paint brush and paint into the base of the Bezel setting. Press in one of your paper sections and use a dry paintbrush to smooth down from the centre outwards this also removes any air bubbles that may have got trapped underneath the paper. Don’t forget to pay attention to the edges. In my design I used a simple striped background paper and decided I’d like to embellish this with some detail. I picked out some tiny images from a scrapbook paper; these also need to be sealed with Glue ‘n’ Seal and cut out once dry. I then painted an extra layer of Glue ‘n’ Seal onto the background paper and placed the images inside the Bezel. To finish, coat with another layer of sealant and leave it to dry thoroughly. To finish with glass cabochons squeeze a thin and even coat of Glossy Accents over the back of the tile, let it spread out naturally to cover the whole area and press firmly into the Bezel. You will need to press firmly from the centre out to the edges to squeeze out any air bubbles that may have got trapped underneath. To set charms or watch components into the bezel place your chosen Charms into the Bezel and arrange them. Now squeeze Glossy Accents into the Bezel starting close to the charms and working your way out to the edge. Fill the whole recess, completely covering the charms with Glossy Accents . Once the recess is filled take some time to prick out any air bubbles which may have appeared. 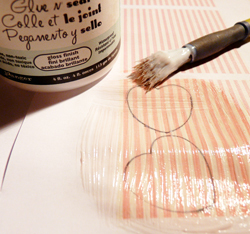 Use a pin or gently tap the surface of the bubble with a dry paintbrush. Leave to set completely, this usually takes around 24 hours to set to a hard clear finish. Once dry you may notice that there are some areas that have appeared unfilled, simply squeeze on another layer of Glossy Accents and leave to dry. You can repeat this as often as needed. TIP - When using Glossy Accents it is important that the bottle isn’t shaken at any time as it creates air bubbles. These air bubbles will then pass through the nozzle and appear in your finished piece, which you don’t really want. I finished my pendant with a tiny resin rose cabochon from my own bead stock to add another dimension to the finished piece. 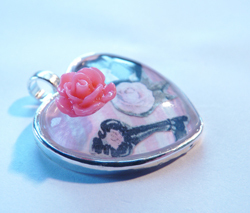 If you don’t have any of these available you can simply use a charm attached with a jump ring to finish or one of the Lucite Flowers which are available on the International Craft website. I'm a new customer. Love the blog, I'm going to have a go at this! Thank you for inspiring us how to do this, it is informative and the steps are well written.